General of Cavalry Ernst Wilhelm von Hoeppner (14 January 1860 - 26 September 1922) was a German cavalry officer who served as the Commanding General of the German Air Service (Luftstreitkrx�fte) during World War I.
Ernst von Hoeppner was born in Tonnin on the island of Wollin in Pomerania on 14 January 1860. He attended the Cadet School in Potsdam from 1872 and in 1879 he was commissioned as a second-lieutenant in the 6th Magdeburg Dragoon Regiment. He attended the Prussian Military Academy in 1890 and from 1893 to 1899 von Hoeppner was a member of the 14th Dragoon Regiment stationed at Colmar in Alsace where he commanded a squadron. In 1902 von Hoeppner was appointed to the General Staff and in 1904 he was appointed as a staff officer with the IX Army Corps in Altona. By 1906 von Hoeppner was a lieutenant-colonel when he was given command of the 13th Hussars Regiment in Diedenhofen. Two years later von Hoeppner was appointed chief of staff of the VII Army Corps and in September 1912 he was made commander of the 4th Cavalry Brigade in Bromberg. In 1913 von Hoeppner inherited his title of nobility. At the start of World War I von Hoeppner was Chief of Staff at the III Army Corps headquarters. He remained in this post until spring of 1915 when he took up command of the 14th Reserve Division. Later in 1915 he was appointed Chief of Staff of the II Army Corps and in 1916 he became the commander of the 75th Reserve Division. 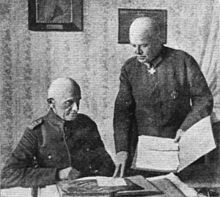 In October 1916, General Ludendorff decided that the German Air Service needed greater unity of command with a general officer having authority over all the Army's aerial combat and anti-aircraft units both in the field and at home. Ludendorff chose von Hoeppner as the new air commander and it was at this time the Air Service was renamed from Fliegertruppe to Luftstreitkrx�fte. Von Hoeppner was given the title of Kommandierender General der Luftstreitkrx�fte (Commanding General of the Air Service - sometimes abbreviated to Kogenluft in German), holding the rank of Lieutenant-General. Von Hoeppner was directly responsible to Hindenburg at Supreme Army Command. Von Hoeppner reorganized the fragmented air services, greatly increasing the number of Jastas and forming them into Jagdgeschwader. Priority was given to the development of strategies for massed air attacks. In 1917 von Hoeppner was awarded the Pour le M�rite even though as a senior commander he was not directly involved in air combat. The award was resented by some of his junior officers. After the War the German Air Service was dissolved. The German War Ministry issued orders for Von Hoepppner's post to be disestablished on 16 January 1919 although he appears to have continued as Commanding General for a few more days. His final order to his Air Service personnel was issued on 21 January. Von Hoeppner took up command of the 18th Army Corps on 10 April 1919. However, von Hoeppner did not remain in the Army for long. He resigned from active service at his own request at the end of November 1919. Von Hoeppner retired as general of cavalry with permission to wear the uniform of the 13th Hussars Regiment. In 1921 von Hoeppner published Deutschlands Krieg in der Luft ("Germany's War in the Air"), a study of the German Air Service from 1914 to 1918. On 26 September 1922 von Hoeppner died in Grox�-Mokratz on Wollin and he was buried in his birthplace, the nearby Tonnin. In the 2008 biopic The Red Baron (film), General von Hoeppner is portrayed by actor Axel Prahl.